It is a somewhat unusual pleasure to be able to welcome a modern recording – Pentatone’s – in which the conducting, playing and recorded sound alike are on an equally high level. The Eloquence reissue, for its part, offers several of Mendelssohn’s classic works, conveyed in distinguished conducting and playing which demand to be heard, inevitably without the benefit of modern sound. The Italian Symphony is the only work which is common to both discs and the first movement in each performance soon alerts the listener to the different ways in which the two conductors view the music. Both include the exposition repeat and their timings for the movement are 9:56 (van Beinum) and 11:21 (Manze). The American Record Guide’s Mendelssohn Overview helpfully includes a table of the movement timings of twenty-three recordings, of which fifteen included the first movement repeat. Of these, the longest were Leonard Bernstein (10:43 - DG) and Sergiu Commissiona (10:56). The quickest was Georg Szell (9:49). The only ‘historically informed’ performance in the table – Sir Roger Norrington’s – was timed at 10:25. Discussing the Allegro vivace tempo marking for this movement, ARG mounts a case for an expansive approach by suggesting that “Vivace, lively, should never be confused with Presto, fast. Allegro vivace is not faster than Allegro, but even a bit slower.” The second movement of the Reformation Symphony is also marked Allegro vivace. The Oxford Dictionary of Music (2012) defines Vivace as “Vivacious; fast and lively” but qualifies this by saying that composers have often used it as an indication of mood, rather than tempo. According to the ODM, in the eighteenth century, “it often meant something between allegro and largo”. Perhaps, then, Mendelssohn was looking back to the past when he used the marking and, if so, therein lies a justification for Manze’s tempo. It would be fair to say that, based on their respective tempos, van Beinum is the taut, but not overdriven classicist and Manze is more the expansive romantic, but not exaggeratedly so. In the remaining movements of the symphony, the conductors show broadly the same divergence of approach, although Manze wisely avoids the lingering some conductors are prone to in the third movement’s minuet, marked Con moto moderato. His timing of 6:29 is close to the average in ARG’s table. Sir Thomas Beecham, in his mono recording with the Royal Philharmonic Orchestra (once available on an EMI CD) was one of those who did linger, taking 7:28. As we know, Beecham relished a stately minuet and, the rest of his performance being marvellous, he gets away with it. Beecham is Beecham. As Eloquence’s liner notes suggest, van Beinum’s relatively straight approach captures the feeling of the work while avoiding both sentimentality and superficial excitement (the latter with particular reference to the final movement’s whirling Saltarello). Unfortunately, the early stereo sound – recorded by Philips, not Decca – is not on his side. While decently balanced, it has an attenuated treble, creating a feeling of wooliness which inevitably dates the production. It should be noted that the 31:29 timing given for the work on the back of the jewel case is an error. The sum of the individual movement timings is 26:53, which is consistent with van Beinum’s reading being swifter than Manze’s. The NDR Orchestra, encouraged by Manze, just as successfully carries us into Mendelssohn’s Italian world with their warmth and vitality. Their Saltarello attempts no speed record but captures the feeling of the dance splendidly. The polish, warmth and believable presence of Pentatone’s sound is a fine medium for their performance. The Reformation Symphony was composed in 1830 to mark the three-hundredth anniversary of the Presentation of the Augsburg Confession – a key document of the Protestant Reformation – to the Emperor Charles V in 1530. It seems to have been the work with which Mendelssohn was least satisfied, on occasion speaking of burning the score. It remained unperformed until 1832, by which time the composer had revised it. It was not published, and performed again, until 1868, a couple of decades after the composer’s death. Today, the symphony is better known and esteemed as a worthy part of the cannon, if not as popular as the Scottish and Italian symphonies. Manze’s recording uses an edition prepared by Christopher Hogwood which restores cuts made by the composer. This results in the recording being divided into five tracks rather than the four we are used to: a slow and haunting Recitativo of two-and-a-half minutes is separately banded and leads almost without pause into the final movement. It has been observed (in performances of the score as revised by the composer) that the first movement tends to balance the third and fourth movements (taken together). This would be broadly true of Manze’s performance without Hogwood’s restoration. But the restoration of the cuts tends to swing the balance towards the latter part of the work; perhaps appropriately so, since the weight of the argument in the nineteenth century symphony was beginning to move in that direction. Or perhaps not so appropriate. It’s a matter which listeners must decide for themselves. Of arguably greater import is the question of whether posterity has the right to disregard composers’ final thoughts about their scores. My answer would be a qualified “no”, allowing some exceptions such as in certain Bruckner symphonies. In the first movement’s slow introduction, the strings’ playing of the Dresden Amen is suitably solemn without dragging and the brasses’ interruption is a convincing call to battle. The repetition of the Amen soon gives way to an Allegro which achieves a fine balance between weight and propulsion. In the second movement’s Allegro vivace, the conductor again displays an understanding of this marking – it’s a ‘central’ tempo which does not rush, while avoiding heaviness. The third movement Andante and the wind-dominated Recitativo which follows are beguilingly played. In the Finale, famously based on Martin Luther’s chorale A Mighty Fortress is Our God, the performance perhaps leans too far in the direction of solemnity and not far enough in the direction of defiance. This is particularly so in the version of the chorale played by the whole orchestra at the very end, which should sound powerful but is slightly disappointing. The sound has the same fine qualities heard in the Italian. 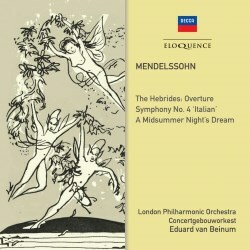 The balance of van Beinum’s recording is occupied by his performances of The Hebrides Overture, the Midsummer Night’s Dream Overture and two items from the incidental music. These performances are similar in style to his take on the Italian Symphony: satisfyingly proportioned, direct but not brusque, classical in feeling and energised. They lack little, if anything, in atmosphere. These are original Decca recordings which, despite being single-channel and obviously old, are distinctly superior in sound quality to the Italian. Again, I would draw the reader’s attention to Klemperer’s boxed set which contains authoritative performances in polished stereo sound of The Hebrides and the Midsummer Night’s Dream Overture and incidental music (reasonably complete, with distinguished vocal contributions). 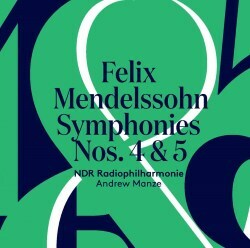 Manze’s disc should be seriously considered by all in search of splendid modern recordings of the two symphonies. Van Beinum’s disc, while uneven in sound quality, will interest all admirers of this esteemed conductor.